Blooms from forced bulbs, for gifts or to keep, can fill the home with the feeling of springtime months before the soil starts to thaw. While some people like to hang on to winter for as long as possible, many are tired of the season and yearn for signs that spring will finally come long before the first blooms of the crocus peep up through the melting snow. Bulbs planted in inside containers in the fall can brighten the home by the time the New Year’s confetti is vacuumed from the rug. Blooms from forced bulbs can give an emotional break from winter with the feeling of springtime months before the soil starts to thaw. Paperwhite narcissus and amaryllis can bloom in four to 8 weeks, while tulip, snowflake, hyacinth and crocus can be forced to bloom in 12 to 14 weeks. Whether you like the clean look of a few straight stemmed red tulips springing from a clay pot to brighten a bleak day or want to combat the dreariness of bare trees with a basket of mixed blooms, a forced bulb container garden will add the color and fragrance of nature that the frigid temperatures have banished for so many months. Six tulip bulbs will fit into a 6-inch pot, or fill the pot with 15 small iris bulbs, crocus or grape hyacinths, or a mixture of the three. The 6 inch pot can hold three hyacinths or daffodils. Make sure you choose only healthy bulbs. While they tend to be fairly safe from insects and disease, an infestation of spider mites could ruin your hard work. Choose a pot deep enough for the root to grow properly, at least twice the depth of the bulb. Fill it to about 3/4 with potting soil. When planting several bulbs in the same pot, leave about a pencil width of space around each bulb. The tips of the bulbs should line up with the top of the pot after they have been pressed into the soil. Water the bulbs and add more soil to cover the bulbs. Set the bulb containers out in a cool place where the temperature will stay between 35 and 45 degrees F. Don’t let them freeze during this cooling period. A cold frame, unheated garage or basement should provide the perfect environment for the bulbs. A refrigerator can also be used. After a controlled winter of 12 to 14 weeks, stems about 2 to 3 inches tall will appear, and it’s time to move the bulbs into the light. Keep the growing garden out of direct sunlight and away from drafts or temperature over 60 degrees F for the first 10 days after you bring the bulbs indoors. Don’t over water, but don’t let the bulbs dry out, either. Smaller pots of forced bulbs can be arranged in a basket to form a tiny indoor garden. Tie a coordinating ribbon around a plain clay pot for a simpler statement. 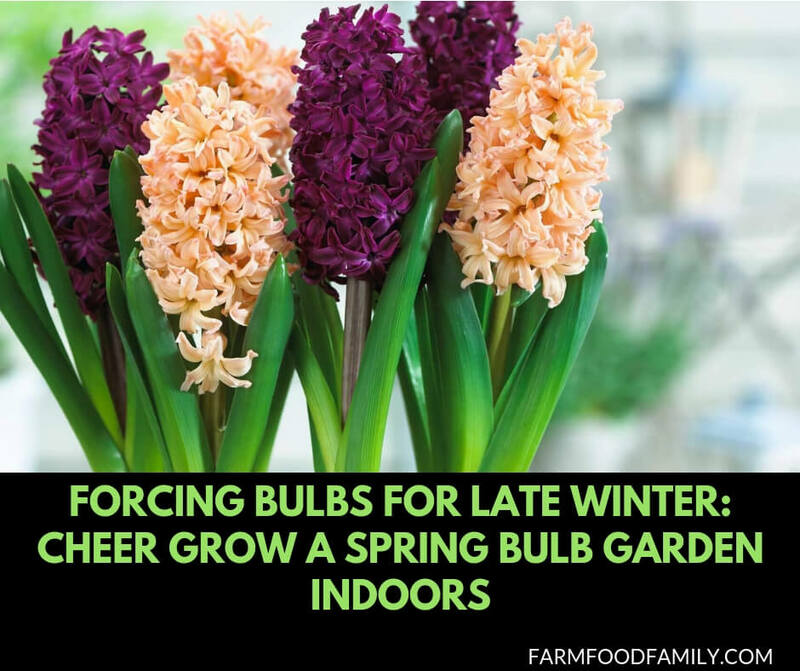 The bulbs should bloom in about 3 to 4 weeks after they are brought indoors. Keeping them cool will keep them blooming longer, giving your home a cheery preview of spring.